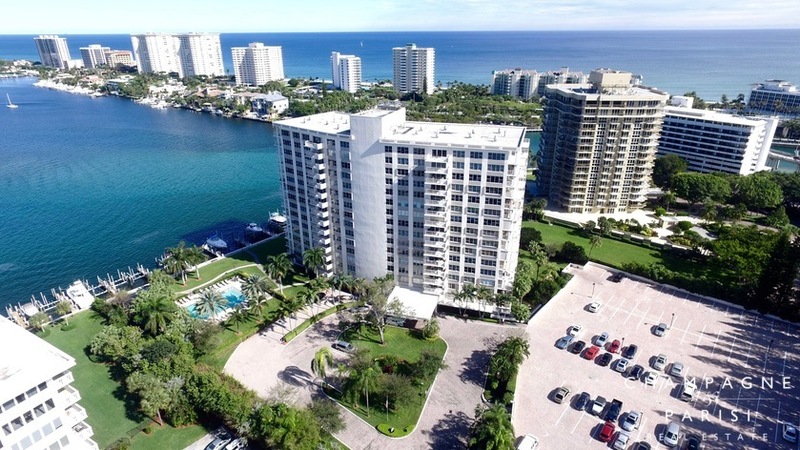 Lake House South is a single sixteen-story high-rise condominium building located on five acres of lush tropical landscape situated at the water's edge of Lake Boca in Boca Raton, FL. This exclusive boutique-style condominium has been artfully designed so that each of the 123 luxury condominium units offers spectacular views of Lake Boca, Boca Inlet, and the Intracoastal Waterway. Lake House South condos range in size from 1,450 to more than 1,900 square feet of living space and offer between two and three bedrooms. These luxury units provide a variety of floor plans and several high-end interior features. Lake House South condos for sale feature custom-designed kitchens with granite countertops and stainless steel appliances, French doors, large master suites with custom walk-in closets, upgraded bathrooms, wood and tile flooring, hurricane impact windows and sliding doors, and spacious balconies. No expense was spared during the recent remodeling of the lobby and common areas at Lake House South. When you enter the doors of Lake House South you will be immediately impressed by the well-appointed lobby and sitting areas complete with luxurious marble flooring, high-end furnishings, beautiful artwork, and modern architectural details. Lake House South offers a host of on-site amenities that are available to residents year round. Residents enjoy use of an Olympic-sized heated swimming pool complete with a beautifully landscaped sundeck with lounge chairs, his and her saunas, fully-equipped fitness center, community library, and pristine picnic area. Poolside there is also a large covered pavilion overlooking Lake Boca Raton with full outdoor kitchen and large picnic tables, making this a popular spot for social gatherings and entertaining friends and guests. Lake House South also offers twenty boat slips that can accommodate vessels of up to 60 feet. Other amenities include 24-hour security, doorman, and secure covered parking. Cable television, water, trash removal, upkeep of the common areas and amenities, and security are covered by the monthly maintenance fees. Lake House South is ideally located just off Camino Real, on the East side of the Intracoastal Waterway. Situated directly on the shoreline of Lake Boca Raton, this premier location is within walking distance of the Boca Inlet and the Atlantic Ocean, as well as the prestigious Boca Raton Resort & Club and Boca Beach Club. Lake House South provides its residents with easy access to many of the areas most popular destinations, including some of the area's finest shopping, dining, and entertainment options. If Lake House South sounds like a place that you would love to call home, you may also want to visit some of the nearby waterfront luxury condominiums such as The Carlton and Boca Inlet. If you would like to learn more about Lake House South or any of the nearby luxury condominiums for sale in Boca Raton, please call us at 561-998-9015. You may also reach us by completing our simple online contact form provided below. We at Champagne & Parisi Real Estate look forward to assisting you in finding your next dream condo in Boca Raton!